Good evening friends! 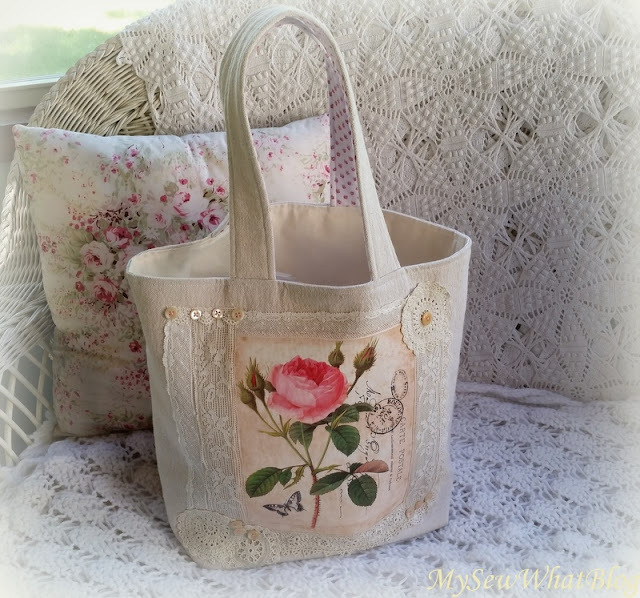 I completed another large tote bag yesterday using a graphic that I purchased online at ArtCult (an Etsy Shop) Click here and I am very pleased with the way it turned out. 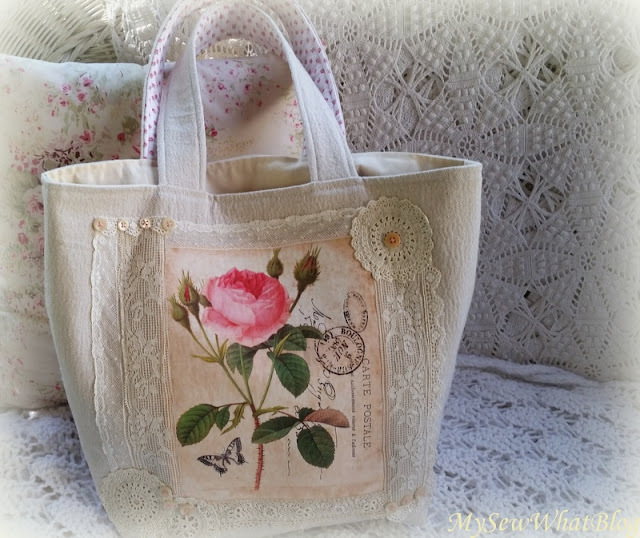 I used lots of pretty vintage laces, some pieces of crocheted doilies, buttons, pink embroidery floss, and of course the lovely vintage rose graphic. I have been experimenting with using graphics and truly I have realized that it opens up a whole world for me! It's both fun and exciting and soon I hope to share some other projects I have been working on that involve graphics being transferred to fabric and other materials. This rose graphic transferred perfectly. I printed this onto a purchased 8 1/2" X 11" sheet of fabric and printed onto it using my HP printer. I then fused backing onto it that allowed me to iron it directly on to the front of the bag and then I appliqued the graphic using a zig zag stitch on my sewing machine. 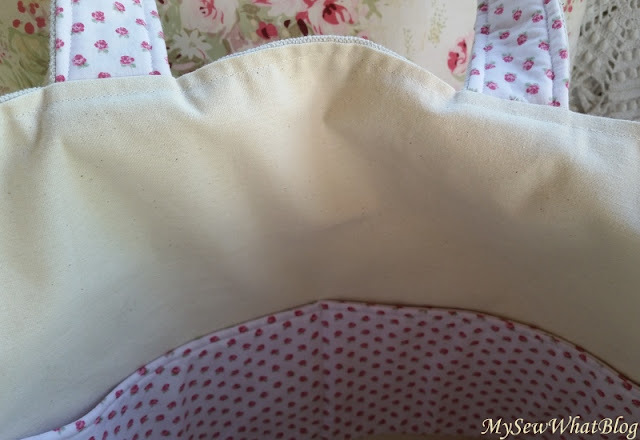 The stitching is all hidden by lots of beautiful vintage lace. 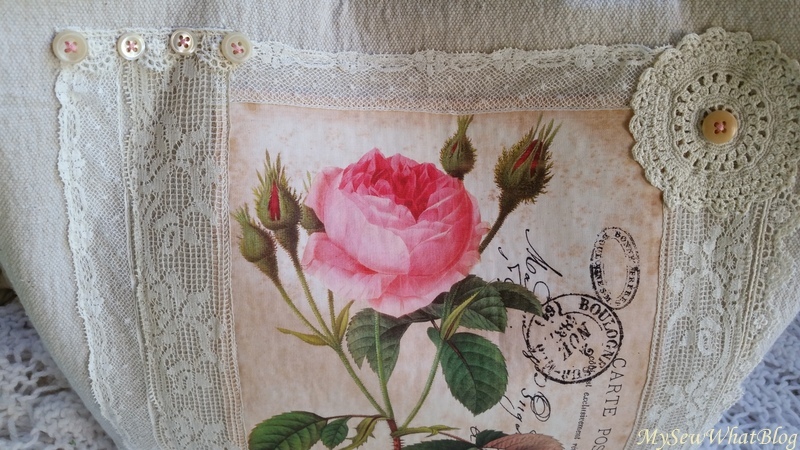 Here you can see a close up of the lace, buttons and small doily. .....and here is a close up of the bottom. I used a small rose print fabric that I purchased online at Moona Fabrics (another Etsy Shop Click here ) for the inside pocket and the backside of the handles. 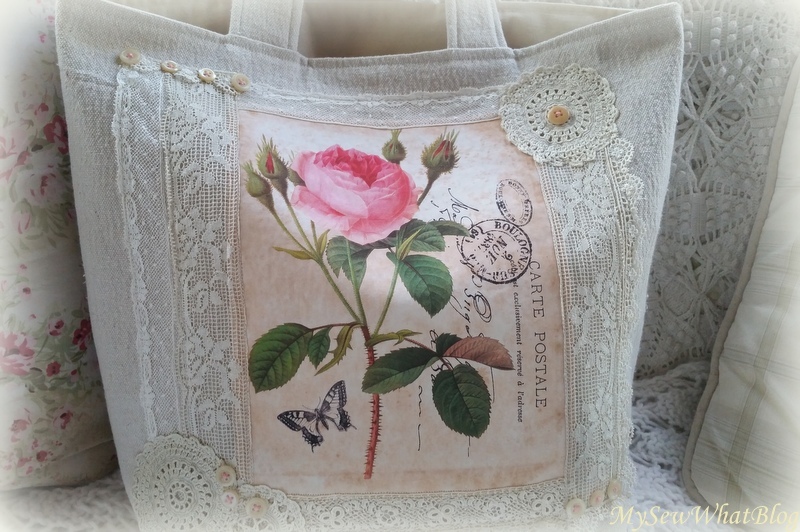 I thoroughly enjoyed creating this Vintage Rose totebag. It took me quite a long time to get the lace placement just the way I wanted it. I have a rather large stash of lace to work with and believe me when I say that I tried many, many different lace combinations. 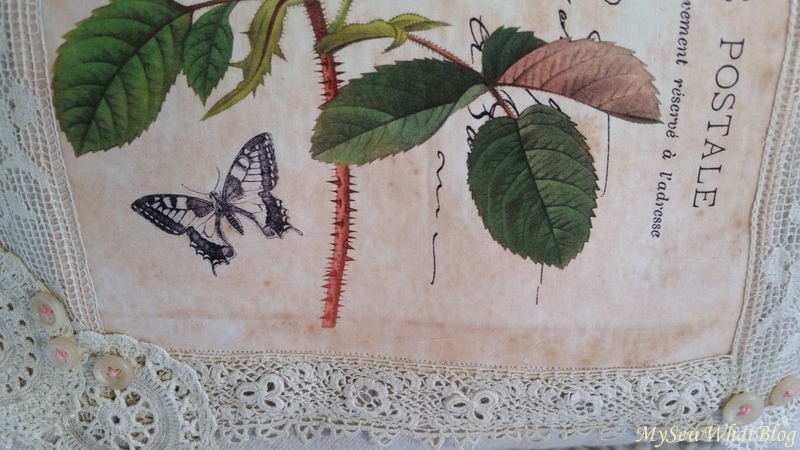 After a while of trying this and that, I became a frustrated at the length of time it was taking me to make a choice ..... and then finally these pieces of perfectly aged, creamy lace, along with the little doily pieces emerged as the winning combination. It is as I imagined. I love it when that happens! Enjoy the rest of the week! Good night friends!